The Israeli municipality declared intention to ban Adhan (Islamic call to prayer) in occupied Jerusalem, Israeli media sources revealed. Israeli mayor Nir Barkat has called for Israeli police's collaboration to stop the ‘noise pollution’ caused by the Muslim call to prayer in the occupied city of Jerusalem. “The Jerusalem municipality would collaborate with Israeli police to enforce noise regulations regarding the call to prayer,” he said. The Israeli decision came as part of the municipality’s attempts to impose control over the city and to wipe out its Islamic and Arab identity. Commenting on the Israeli decision, head of the Islamic Supreme Council Sheikh Ekrema Sabri said that the call to prayer was not just a Muslim religious ritual, but an act of worship, and that attempting to ban the Adhan would constitute a violation of freedom of worship. Sabri added that the real noise pollution was the sound of Israeli military jets hovering in Jerusalem’s sky, the sound of Israeli military tanks raiding Palestinian cities and villages, and the noise of bombs fired at Palestinian citizens. A number of Israeli settlers from illegal settlement of Pisgat Zeev protested in front of the house of Israeli Mayor of Jerusalem Nir Barakat on Thursday morning over the ‘noise pollution’ caused by the Muslim call to prayer. 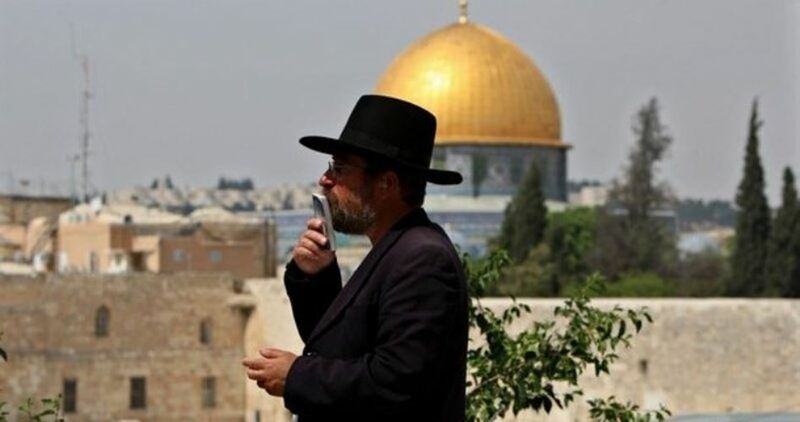 According to Israeli radio station Reshet Bet, Barkat responded to the settlers’ complaints by saying that the Jerusalem municipality would collaborate with Israeli police to enforce noise regulations regarding the call to prayer. The call to prayer -- also known as the adhan -- is broadcast five times a day from mosques or Islamic centers. The spokesperson went on to add that the municipality guidelines would include “increased instructions for muezzin operators regarding technical guidelines for optimal playback and sound amplification, increased mapping of city mosques, and continuous dialogue with local Muslim leadership." Adnan al-Husseini, the Palestinian Authority (PA)-appointed governor of Jerusalem, told Ma’an that the call to prayer was one of the main Muslim religious rituals and an integral part of Jerusalem’s identity. He said that Israeli demands to lower the sound of the adhan was a threat which had been issued several times before in Jerusalem. Al-Husseini said that the sound of the adhan doesn’t rise above an agreed-upon decibel level, adding that Israeli settlers were not annoyed by the noise, but by the call to prayer as a reminder of Palestinian presence in Jerusalem. Former Grand Mufti of Jerusalem Sheikh Ekrima Sabri said that the call to prayer was not just a Muslim religious ritual, but an act of worship, and that attempting to ban the adhan would represent a violation of freedom of worship. Sabri added that the real noise pollution was the sound of of Israeli military jets hovering in Jerusalem’s sky, the sound of Israeli military tanks raiding Palestinian cities and villages, and the noise of bombs fired at Palestinian citizens. Meanwhile, Hatem Abd Al-Qader, a Fatah official in Charge of Jerusalem affairs, told Ma’an that Israel aimed to provoke Muslims by attempting to ban the call to prayer -- although no reports indicated on Thursday that the Jerusalem municipality was attempting to ban the adhan outright. Abd al-Qader said that the Israeli settlers’ protest against the adhan came amid constant violations and raids of the Al-Aqsa Mosque compound in East Jerusalem’s Old City, and demolition of Muslim graves in Jerusalem, which he said were part of a broader Israeli plan to destroy the Palestinian Muslim and Christian identities of Jerusalem and replace them with a Jewish one, turning the Israeli-Palestinian political conflict into a religious one. Palestinian communities in occupied East Jerusalem -- within the municipal boundaries and also beyond the wall in the occupied West Bank -- have long been targeted by Israeli authorities in what has been denounced as a policy of "Judaization" of the holy city at the expense of other religious communities. This “Judaization” has been characterized by the continuous expansion of illegal Jewish-only settlements and a large-scale policy of demolition of Palestinian homes. The Al-Aqsa Mosque Compound has also been the stage of numerous tensions over the years, with Israeli forces imposing tight restrictions on Palestinian worshipers at the site. Many Palestinians fear that right-wing Israelis are attempting to reclaim the holy site, as it sits where Jews believe the First and Second Temples once stood. 554 Palestinians, including 130 children, were arrested by the Israeli occupation forces (IOF) from the West Bank and Gaza in October, rights groups reported. 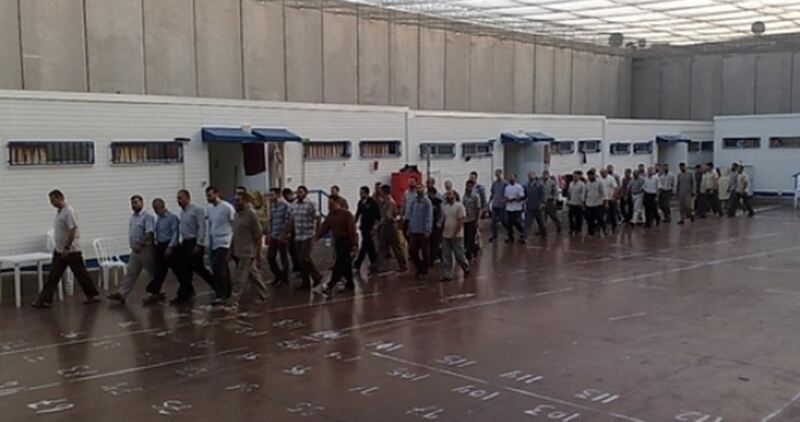 A joint report issued by the Prisoners’ and Ex-Prisoners’ Committee, the Palestinian Prisoners Society, Al-Mezan Center for Human Rights, and Ad-Dameer Institution for Human Rights documented the arrest of 554 Palestinians during October. The report kept record of the arrest of 261 Palestinians, including 91 children, in Occupied Jerusalem, 60 in Al-Khalil, and 54 in Nablus, 48 in Bethlehem, and 30 in Jenin. The IOF also arrested 27 Palestinians in Ramallah and Al-Bireh, 26 in Tulkarem, 23 in Qalqilya, nine in Tubas, eight in Jericho, and four in Salfit. The number of Gazans arrested by the IOF in October was estimated at four. According to the report, 7,000 Palestinians are locked up in Israeli jails, among whom 64 female detainees, including 13 minor girls. The number of children in Israeli Megiddo and Ofer penitentiaries has hit 400 while the number of administrative detainees has gone up to 700 during the same period. About 530 Palestinians were reportedly detained or arrested, including children and women, by Israeli military or security forces in Jerusalem and the West Bank during last October. According to a report released by the Palestinian Prisoner Center for Studies, over 100 minors under age 18, the youngest of them 10-year-old Adnan Amr, as well as 18 women and girls, mostly from Jerusalem, were either detained or arrested last month. 250 of those arrested Palestinians were from Jerusalem and six from the Gaza Strip. The detainees also included two journalists from al-Khalil and the 1948 occupied Palestine. The report also noted that Israel’s military courts issued 120 administrative detention orders, without indictments, against Palestinian internees. 36 of them were for the first time and 84 were extensions. Following a number of controversial excavations in recent weeks to Islamic holy sites, a new violation took place Tuesday by Israeli troops who accompanied Israeli government officials to demolish a Muslim cemetery. The destruction took place at the historic Bab al-Rahmeh cemetery, near the al-Aqsa Mosque in east Jerusalem. Parts of the cemetery had been confiscated by the Israeli government in 2015. The cemetery dates back more than 1400 years, and is considered one of the most significant Muslim historic sites in East Jerusalem, according to representatives of the Islamic Waqf of Jerusalem. Mustafa Abu Zahra, the head of the Committee for the Preservation of Islamic Cemeteries, told the Anaolu News Agency that the Israeli officials were from the ‘Israeli Nature Authority’, and that a number of soldiers accompanied them into the cemetery with heavy equipment to carry out the destruction of the graves. At least eight graves were destroyed, according to Abu Zahra. The Israeli government plans to turn the area into a park for Israeli Jews, which will exclude Palestinian residents of the West Bank and Gaza. The Israeli occupation authorities (IOA) embarked on a bid to finalize the high-speed railway and add another line connecting Tel Aviv to Western Occupied Jerusalem. 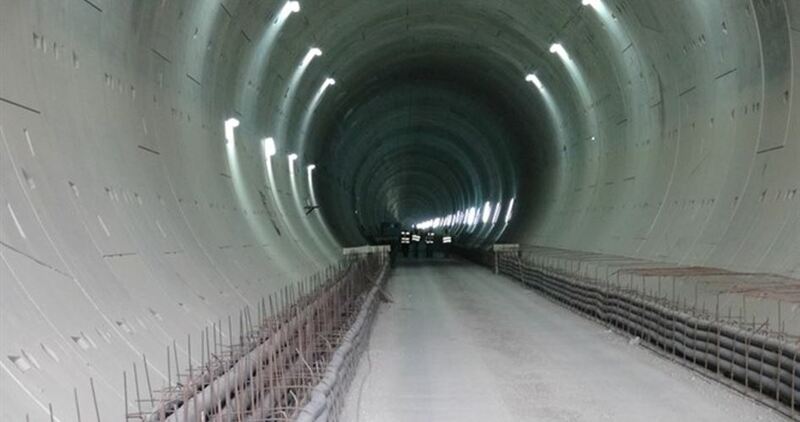 The railway line will involve digging tunnels for two kilometers at a depth of 80 meters. Scheduled to be fully operational by 2018, the railway will be vital in lowering journey times between Tel Aviv and Occupied Jerusalem. At a cost of $1.8 billion, the high speed link allegedly aims to lower the journey time by rail and to reduce the road traffic congestion on this route. The Israeli Minister of Transportation and Road Safety Yisrael Katz has instructed the extension of the high-speed railway line from Tel Aviv to Occupied Jerusalem so that it extends into the Old City, near the Western Wall. As part of the project, an underground stop will be built in the Western Wall area. The high-speed railway project costs are estimated to be about NIS 7 billion. It includes the laying of 56 kilometers of tracks, which go from Tel Aviv, through Ben Gurion Airport and the illegal Modi'in settlement, and end in Occupied Jerusalem. Trips from Tel Aviv to Occupied Jerusalem are expected to take just 28 minutes. Work on the line is expected to conclude by the end of 2017, with its first voyages planned for Passover 2018. Three trains are expected to launch between Tel Aviv and Occupied Jerusalem each hour during peak times of day, with a total of four million trips per year. Observers said the project makes part of an Israeli Judaization scheme aimed at smoothing and boosting Israelis’ presence in the holy occupied city of Jerusalem and wiping out the typically Islamic character of the city. The High Presidential Commission for Church Affairs in Palestine strongly condemned Tuesday the raising of Israeli flag over the eastern entrance to the Holy Sepulchre Church. 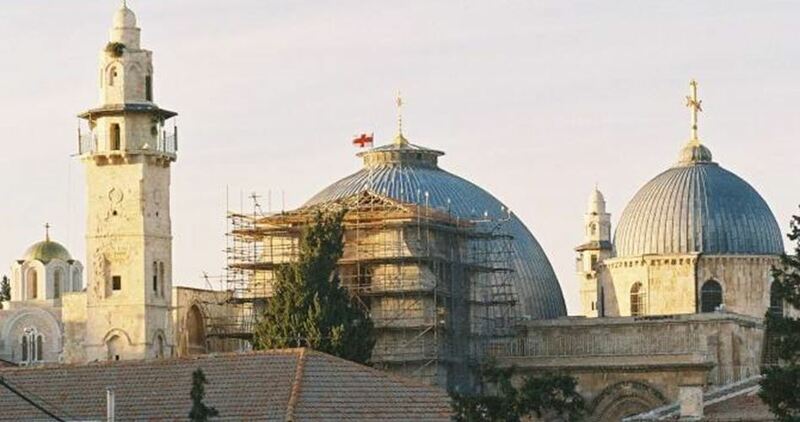 Raising the Israeli flag on Holy Sepulchre Church is a flagrant violation to the 2012 resolution which recognized Palestine as a non-member observer state in the United Nations, the commission said. The commission stressed the importance of maintaining the Status Quo Law in occupied Jerusalem which preserves freedom of worship for all religions, and prevents the raising of any flag over holy places. It also called for standing firmly against any Israeli attempt to impose control over the Palestinian holy places. Earlier on Monday, Israeli extremist groups raised the Israeli flag over the Holy Sepulchre Church. Israeli Antiquity Authority staff members, escorted by armed police and soldiers, stormed on Tuesday morning Muslims’ Bab Al-Rahma Cemetery, in Occupied Jerusalem, and filled eight tombs with dust pile. Head of the Islamic Cemeteries Committee, Sheikh Mustafa Abu Zahra, slammed the break-in. “The Israeli occupation forces violated the sanctity of the cemetery and covered up eight graves prepared for the burial of dead Muslims,” Abu Zahara told the PIC. “I headed to the cemetery and scrutinized the scale of destruction,” he stated, adding that a lawyer has been hired to file a lawsuit over the assault. According to Abu Zahra, the Israeli Antiquity Authority claimed ownership of the Bab Al-Rahma Cemetery, which has been an Islamic property for over 1,400 years, as has been corroborated by documents and historical records. 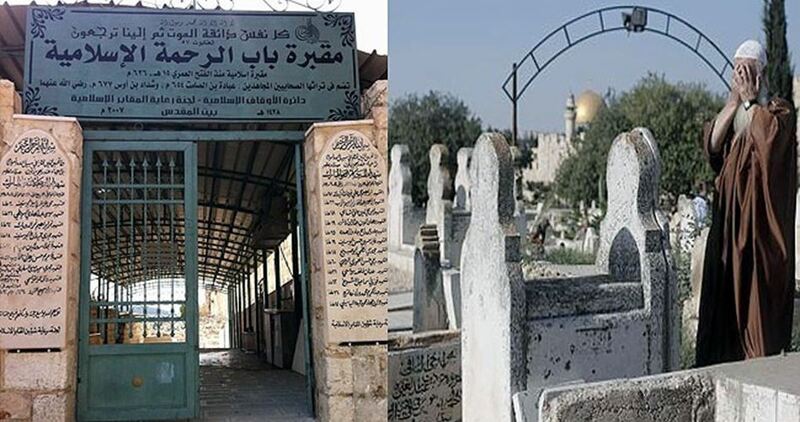 The Israeli occupation authorities seized parts of Bab Al-Rahma Cemetery, adjacent to the holy Al-Aqsa Mosque, to build parks for Israeli settlers residing in illegal outposts across the occupied Palestinian territories. Muslims have, meanwhile been banned from burying their dead relatives in the cemetery. The Bab Al-Rahma Cemetery draws much of its sacred character from the fact that it has been a home to the cadavers of a number of Companions of the Prophet of Islamic, Mohamed (Peace Be Upon Him), including Ubada Ibn Al-Samet.